This is in its very early stages, many links to resources need to be added — please tell us how to improve it. This is place where you can find out more about what it means to be a disciple of Jesus and what resources the North Kent Methodist Circuit provides to support you and your church in this. One of the things that Jesus asked of us was to "make disciples of all nations." Sounds simple! Well it can be, so long as to start with we are good disciples ourselves. When Jesus calls us to follow Him we are faced with a choices. Do we follow? Do we turn away? If we follow, what kind of life are we? In saying this He did not just mean "walk with me", but to "do the things I do, live the life I live." The call to make more disciples involves two things. Firstly, to baptise, and bring people into a relationship with God. Secondly, to teach people to be like Jesus. As he says in the great commandment, "....teach them to obey everything I have commanded." So as his disciples we are commanded to go into the world and "invite" people into a relationship with God and then to "teach" them his commandments. This means that we are asking people to change just as we have changed and this is the challenging part of our work. 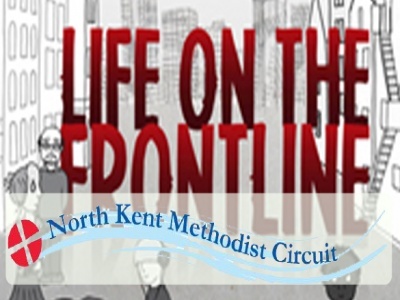 In 2013 the Circuit chose to invest in a programme of small group resourcing called Life on the Frontline. This programme of study challenged people to look closely at their week, the time when they were not in church, and identify their front lines, the places where they could make a difference and bring more people into a relationship with God. Where they can help to grow the Kingdom of God. This programme has now grown into a new movement within our Circuit called the Frontline Discipleship Movement. New small groups called leadership Huddles have been established in a number of churches. These groups have been studying the discipling programme called Lifeshapes with the aim of turning "Learners" into "Leaders". The links below will take you to different parts of the work we are doing and the give access to the resources. There is also the opportunity to share news and views from all those involved in the Frontline Discipleship Movement. What is it like to be on mission in the centre of Sheerness? how do I set up a new small group in my church? and much more.